Matt Sandy, assistant planning director for Kosciusko County. 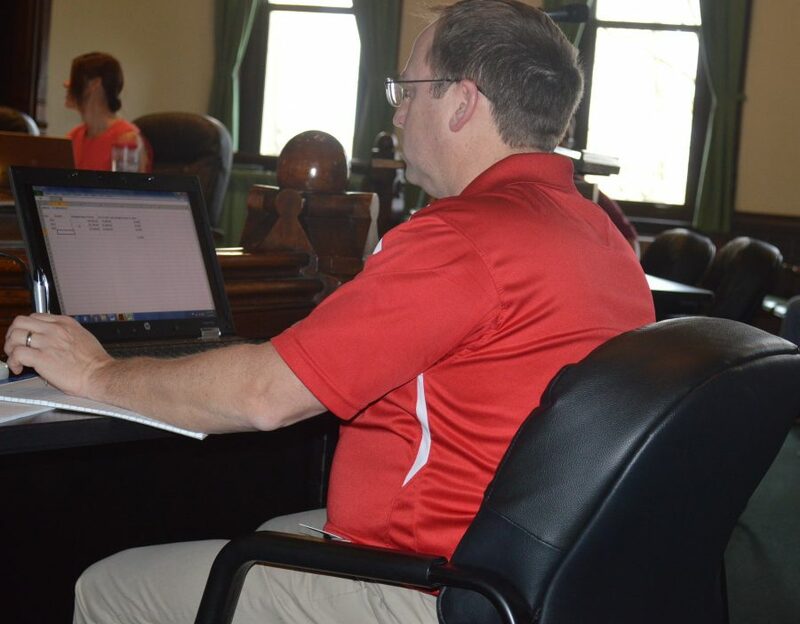 WARSAW — Don’t let the government solve the problem, but instead work it out among yourselves was the message given during the regular monthly meeting of the Kosciusko County Area Planning Commission Wednesday afternoon, May 2, in Warsaw. More specifically, a petition was submitted by Randy Plew and Rich and Marsha Presser to have a public way vacated in the Epworth Forest plat at Webster Lake. The public way is essentially an extension of Wade Lane to the lake, noted Dan Richard, area planning director. He added this is the first time a request has been submitted to have a public way vacated in this plat. Marsha Presser said her daughter slipped and fell due to a crumbling seawall and the family is concerned about the safety of the area. After talking with Plew, the Pressers and Plew felt asking for the public way to be vacated is the best option. Marsha noted they are willing to have a 5-foot walking easement put in down the middle of the public way. Plew noted the easement doesn’t really go anywhere and is too steep for lake access, though it can still be walked on. He said the two families are willing to have the seawall and bank fixed and also pay the taxes involved. Several remonstrators spoke against the petition including Carol Price, who said the public ways “have always been put in” even after multiple changes to the plat since its origins in the early 1900s. Another remonstrator questioned the actual intent of the petitioners, saying they may have “more far reaching plans” including shutting down more public ways. George Arnold, president of the Epworth Forest Property Owners Association, said the association does not support any loss of a right of way in Epworth Forest. But, he added, there is a willingness to work with property owners to fix seawall or similar problems. After the remonstrators spoke, Lee Harman, chairman of the APC, said he felt the property owners should try to work with the association since a safety issue is involved. Richard noted it is probably best for the parties involved to try to reach an agreement and not let the government try to solve the problem. Eventually the APC unanimously recommended denial of the petition and the county commissioners will consider it at their May 29 meeting. In other business, the planning commission voted to refer a petition by Ideal Construction of Northern Indiana to the county board of zoning appeals. Ideal Construction wants to rezone two tracts of ground from industrial II to commercial on the east side of SR 15, north of CR 350N in Plain Township just outside the city of Warsaw limits. Andy Hostetler of Ideal Construction said Edward Jones wants to lease an office building on one tract and Servpro wants to lease another building on the tract to the rear of the office building. Richard noted the city of Warsaw expressed concern rezoning the land to commercial could open the door for more intense commercial use in the area. It was decided to refer the petition instead to the BZA to see if an exception could be granted and allow the property to remain zoned industrial. Also during the meeting, the planning commission recommended approval of an amendment to the county’s flood control ordinance. It would allow homeowners in flood zones to make cumulative repairs to their homes up to 50 percent of the market value of the home. Presently, only one repair is allowed and thereafter homeowners must raise the home up out of the flood plain if more repairs are needed. County commissioners will consider the amendment at their May 29 meeting.